466 pages | 13 Color Illus. | 46 B/W Illus. The dynamic and fast-expanding business events sector plays a vital role in the professional lives of hundreds of millions of people worldwide by providing settings in which they can meet for the purposes of negotiation, deliberation, motivation, the dissemination of knowledge, and the celebration of their greatest career-related achievements. This book provides a sound practical and theoretical context for the study of this subject by covering, in depth, all categories of business-related events including corporate meetings, association conferences, political events, incentive travel, exhibitions, corporate hospitality, awards ceremonies and SMERF (social, military, educational, religious and fraternal) gatherings. 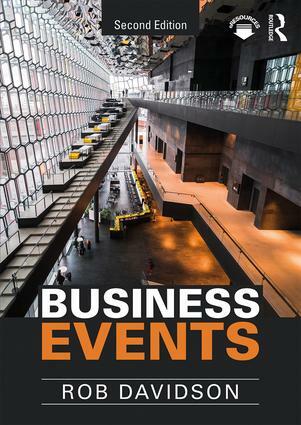 Written in an accessible yet analytical manner, Business Events is essential reading for all students of events, tourism and hospitality management. Dr Rob Davidson is the Managing Director of MICE Knowledge, a consultancy specialising in research, education and training services for the business events industry. He is also a Visiting Professor in four European universities (Strasbourg, France; Karlsruhe, Germany; Lugano, Switzerland; and Krems, Austria) and he is a Visiting Fellow at the University of Greenwich in London, UK.